I was so excited as I was going to attend my first Karate class today. 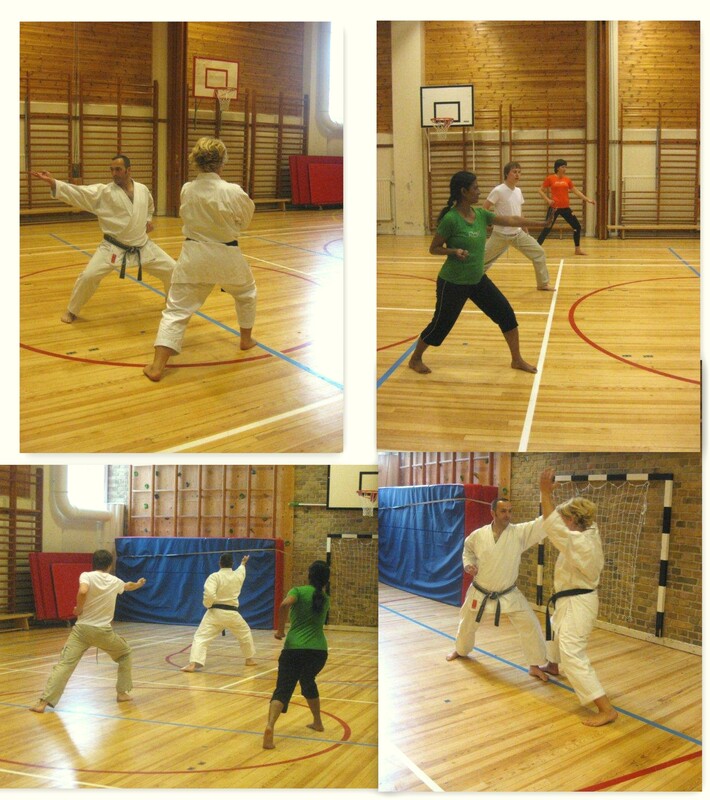 I am not a big fan of martial arts, but when given a chance to try out something new, why not try it out ;). So me and a few people from work set out to do some kicking. The class was arranged in a school gymnasium and there we 2 instructors in their nice karate robes. We dressed up in our sports wear, unfortunately no karate robes for us. And then the class started. We started with some warm ups along with breathing exercises. Once we were all warmed our instructor showed up a simple 3 step move. It was kind of punch, raise, slice kind of action. Though it was a simple step, believe me it was kind of very tough to remember that. Thats when I realized, Karate is not just like any other activity, but requires intense concentration in remembering the moves. We started with the hand movements and once we got hold of the steps, we combined it with breathing. This breathing when combined with the hand movements gives you that sharp intense strike. Then we started with the leg movements, we moved from one end of the hall to the another, combining our hand, leg and breathing movements. I totally screwed it up in coordinating these 3 together!!. After doing some 2 rounds of up and down, it was time for Mortal Kombat. We paired up and were ready to learn some attack and defense mechanisms. Our instructors, a lady and a man, first showed us a few fights and it looked so beautiful than deadly. It was like a dance. The steps, the movements, the way your hands hit, the way your eyes watch, the way your legs respond. It was simply beautiful. Then it was our turn. First we bowed to our opponents as a mark of respect, which also meant that we will have a fair fight and wont break our opponents bones ;). The hands movements we learnt earlier were actually, attacking mechanisms. It was like punch in the stomach, hit on the shoulder and slice across the neck. While one of us attacked, the other person defended with their arms. The place and the way you hold the attackers arms to stop from attacking you, makes a lot of difference. Then we combined our hands and leg movements to learn the attack-defend mechanisms. After learning some hitting and punching, we moved on to the next step i.e self defence. This was the part I loved the most. Our instructor showed us 2 steps, which looked so simple, but the way one can release oneself from any grasp was amazing. One was if someone holds your hand, to free yourself you have to catch the attackers hand with your fingers and twist your hand to let go of the grip and after the twist the attackers hand will be in your grasp. It was simply amazing on how a simple twist and movement, can turn things around. The second one was when someone holds your hand, say at the wrist, just pull your hand towards yourself and then hit the attacker on his chin with your elbow from the bottom. So now if someone try to catch hold of me I know how to defend myself :). It was truly amazing. Our instructor volunteered everyone to hold his hand and how he could free himself from any grasp with a simple twist of his arm. We all tried with all our strength, and our 2 hands, to just hold his hand and he with just a twist went free!! Karate is not about physical strength and how stronge you are. It about how you use your energy and combine it with the movements. It more of a mind game than a physical strength. Each movements should come from inside with an intense energy. Thats where the breathing helps. After all the lessons, we were asked to sit down on the floor with our legs crossed and breath slowly and try to remember what all we did from starting. Once we do this, we visualize everything in our mind and it stays in our mind. I was told that we just learnt 1 step today in the whole 90 min class. They were such thousands of steps and movements in this art. It was hard for me to remember this one step, so one can imagine how much concentration one has to put in to learn this ancient art. Its a mind, intelligence and strength game. We took a bow to show respect to our teachers and thanked them for introducing us to the wonderful art. Atta girl! Awesome! I am so proud of you, of everything that you are doing. You go girl….